Technology is moving at an incredible rate and automating much of what accountants and bookkeepers have traditionally done. And whilst that might be scary, it opens up many opportunities to add more value to clients. However, it is more critical than ever before to change our pricing models. As technology automates data entry and compliance work when we cling to the old-fashioned time-based method of pricing we will see significant downward pressure on price. Simply put, time-based billing is no longer sustainable. We must switch to value pricing. The trouble is, value pricing is hard. It’s hard because value is subjective. And to make things worse, every client values things differently. 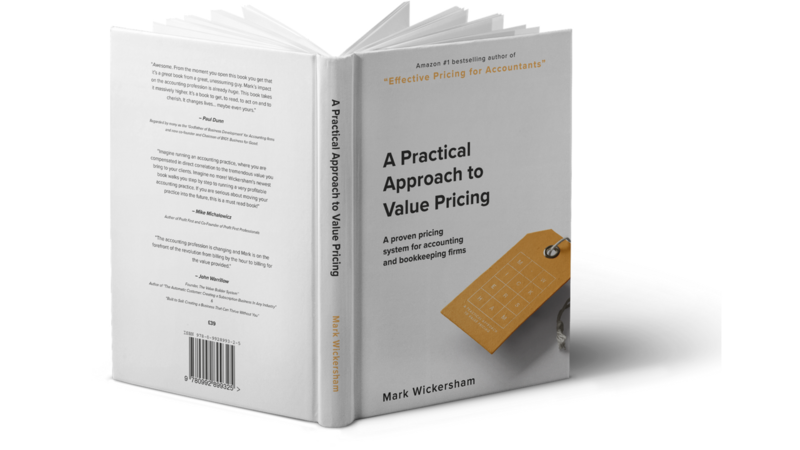 To make the successful transition to value pricing we need a system. And that’s what this book gives you. A 7-step formula you can use to price anything and get better results. Not only is this book highly practical, it is inspiring too. That’s because it is backed up by dozens of stories from accountants and bookkeepers around the world explaining how they have made the transition to value pricing and the results they are getting. These stories are incredible and show you what is possible when we change our pricing model. Why do we keep giving stuff away for free? What about clients that can’t afford you? Save £14 on the Amazon price and get a digital copy as a bonus for your Kindle.